The California event, War of the Heroes 8 completed on November 13th, 2010 Saturday night at the Santa Clara Convention Center and the results are in. Phanuwat ‘Coke’ Chunhawat won a split decision over Jose Palacios in a professional Muay Thai bout. Palacios while not new to Muay Thai was certainly the junior to Chunhawat’s extensive record and experience in Muay Thai. Palacios is also an MMA competitor. Reportedly, the bout was close with at times Cung Le trained Palacios gaining the upper hand. Ultimately, it was determined that Chunhawat had done enough and was awarded the win by a close split-decision. Speculatively, a rematch would seem to be the next logical sequence for both Chunhawat and Palacios. In the semi-main event Bryan Petro of the bay area faced off against Roy Corona. Combat Sports Academy standout Bryan Petro successfully defended the United States Muaythai Federation (USMF) amateur championship by KO. 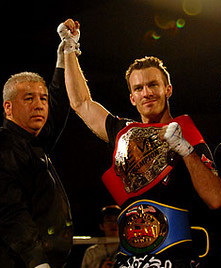 As a result Petro also leaves with the Muay Thai Association of America title formerly held by Corona. Petro adds another accomplishment to his title wins (IKF, USMF North America welterweight titleholder) and through this win will be an American representative at the (International Federation Muaythai Amateur (IFMA) World Muay Thai Championships held in Bangkok, Thailand. ~ by fatsoking on November 18, 2010.